Hey there! So today is my day to play along in Thomas's Jellybean-a-thon! I know, you don't know who I am or why the hell you're even looking at this sad old blog. That's OK. Don't fight it, baby, just go with it. Thomas sent all 10 colorways of the Jellybean print and asked for a project that incorporated them all. 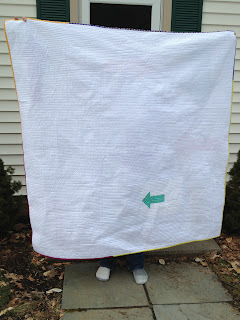 I knew I wanted to make a quilt, and I knew that wonky and improv-y was about all I could handle. So I started making some arrows and I love the way it came out. 9 on front, and the 10th print is in a little arrow on the back. And then I just randomly grabbed a few for the binding. 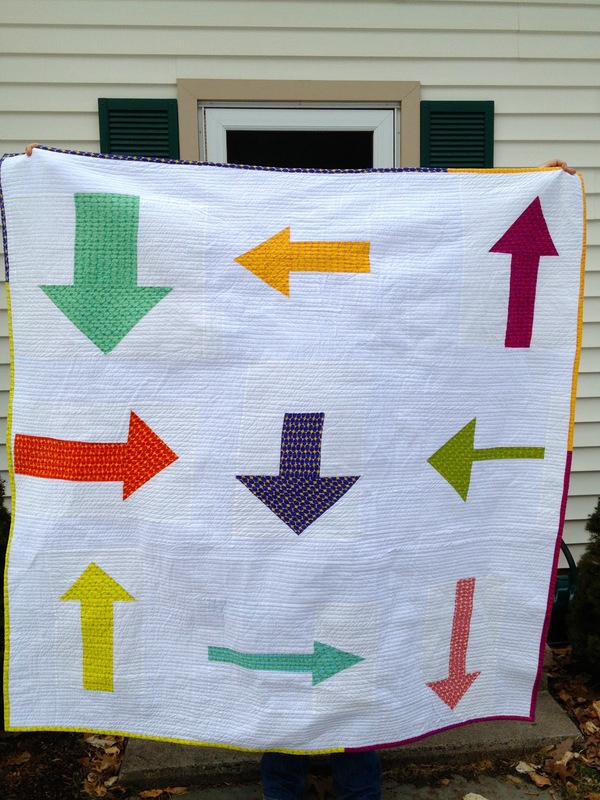 I call this quilt "Which way did he go?" and I keep imagining the scarecrow from Wizard of Oz with his arms tangled and pointing both ways. These prints are so great. The color combinations are dissonant, and yet somehow they end up really reading as solids. It's basically magic. Thomas is so smart and so cool. Don't tell him I said that, though, we don't need him getting too big for his britches. Oh, hi Thomas -- please don't read that last sentence! Make sure to check out everyone else's posts, too! That's so cool. Welcome back to blogland! I like this. Great job with the spacing/layout. 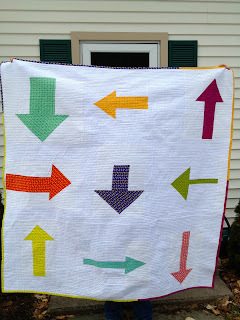 A bit like controlled randomosity (its a word, at least in my head :) ) Nice movement around the quilt. I like the bitty arrow on the back, especially as its pointing to the human easel.